Is it possible to do more than one task well at a time? Multitasking is like a trick we play on ourselves—because we’re juggling more tasks, it feels like we’re getting more done. Computers and smartphones allow more opportunities to multitask than ever before—we can send a text, post to Instagram, play a game, and watch a video all on the same screen. It may seem like our tech savviness should make us better multitaskers, but evidence suggests it may actually be weakening our brains. 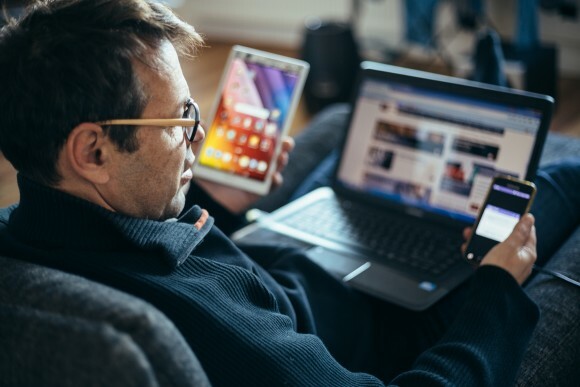 Researchers from Stanford University found that students who habitually juggled multiple media streams had worse concentration and a shorter attention span than peers who kept tech multitasking to a minimum. If you’re dividing your attention among two or more tasks, they are mutually suppressing each other. At the heart of our multitasking deficiency is the limitations of our biology. Only computers can make several calculations at once—the nature of human attention requires a single focus, says neuroscientist Susana Martinez-Conde. This suggests that multitasking—at least for humans—is impossible, because our brains can’t pay attention to two things at the same time. A more accurate term may be “task switching,” and most of us are pretty lousy at it. Experts estimate that less than two percent of the population is efficient at task switching (they’re called supertaskers). Everyone else requires a lot of mental effort to move their brain from one task to another, and the more attention a task requires, the harder it is to make the switch. Coordinating activities that require little attention, like eating a sandwich, checking your email, and watching a show may be achievable. But the consequences can be devastating when you switch between higher attention tasks, like texting and driving. One study found that people who drove while talking on their cellphone (even with a hands-free device) performed as poorly as drunk drivers. If humans are such poor multitaskers, why do we embrace this behavior? Martinez-Conde approached this question by studying magicians. In her book “Sleights of Mind: What the Neuroscience of Magic Reveals About our Everyday Deceptions,” Martinez-Conde and fellow neuroscientist Stephen L. Macknik demonstrate that the same tools of misdirection used in stage magic also keep us blind to the multitasking spell. “It’s basically a divide and conquer strategy,” she said. Since our attention works best when we devote it to a single focus, a magician often uses multiple distractions to hide the details of a trick, thus creating a convincing illusion. A similar scenario plays out when you’re sitting at the computer doing work, paying bills, or performing other high attention tasks. Every few minutes, a buzz or beep alerts you to an instant message, text, or Facebook update, prompting you to task switch. Because these distractions seem so small, we believe they have little impact on our work. But they still chip away at our time and focus. “Every time you do that, you lose time, anywhere between 30 seconds to five minutes, but this really adds up by the end of the day,” Martinez-Conde said. In a world where people expect a quick response, there’s a lot of social pressure to stay connected to our devices. But there is also an addictive aspect to our constant connectivity that further erodes our attention. Research from Ohio State University found that students were more likely to turn to digital distractions when they needed to study. Students could see that this behavior was a setback in achieving their goals, but their multitasking habit made them feel more emotionally satisfied with their study experience. Psychologists refer to these types of habits as providing “intermittent reinforcement.” It’s the same mechanism that makes gambling so addictive. When we constantly check our social media, for example, usually nothing has changed. But eventually something novel pops up, and we’re inspired to respond right away. This occasional and unpredictable reward keeps us engaged in a platform where most of the time there’s nothing to see. “It’s a very powerful reward for the way our brains are wired,” Martinez-Conde said. Employers are also hypnotized by the allure of multitasking. According to Conrado Lamas, head of marketing at a tech startup in Spain, companies see big savings in workers who can juggle. “Technology over the past few decades made offices concentrate what three, five, sometimes 10 people used to do as their full-time jobs,” he said. Lamas says organizations will only invest in focused professionals when they see an incentive for it. But according to Margaret King, a cultural analyst who studies human behavior for major corporations, employers fail to see this incentive because they don’t measure how much multitasking hurts productivity. In places where you have to do a lot of multitasking, people burn out and they quit. “Switching back and forth is where all the cost is, and we’re not going to solve that problem because that’s just the way your brain works,” said King. In customer service, for example, employees may have to answer the phone, deal with customers in person, operate a computer, and go to the stockroom to check on an order. All of these tasks come with individual challenges, but constantly switching among them costs more than time. Completing a project requires time and attention. But many employees work in offices so full of distractions they don’t have the space to get things done. That’s why King sees many employees taking work home. “At work, you can’t say to your boss, ‘I can’t talk to you right now.’ At home, you don’t have to socialize—if your family understands this, or you live alone. Then you can finally focus,” King said. Productivity-minded architects are now reimagining office spaces to be more geared toward concentration and less toward socialization. In the meantime, experts recommend banishing the distractions you can control. For King, the key to time management is setting priorities. Instead of trying to do everything at once, identify what’s most important, and put all your energy into accomplishing that single goal. “If you take care of your top priority first, everything else straightens out,” she said.